Few things brighten our days more than tree houses - especially those that we can actually enjoy ourselves. 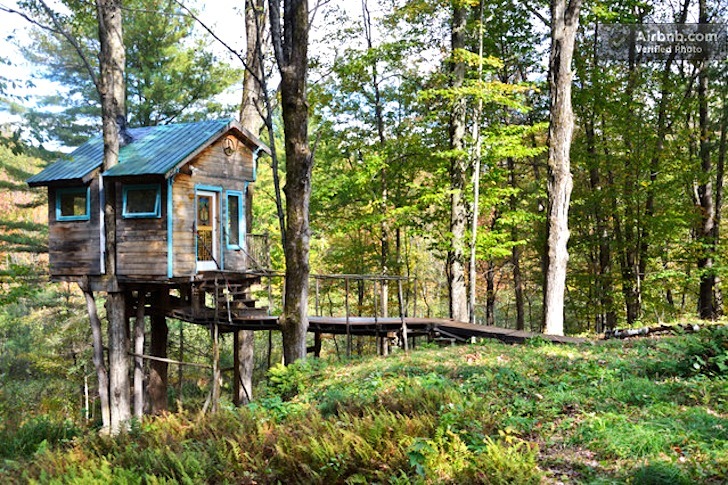 This charming Tiny Fern Forest Treehouse is an AirBnB destination in Lincoln, Vermont that sits 30 feet above a cushion of ferns amidst four maple trees. This arboreal abode offers a single bed on the main level and a queen-sized futon in the loft - and it comes with a continental breakfast too! 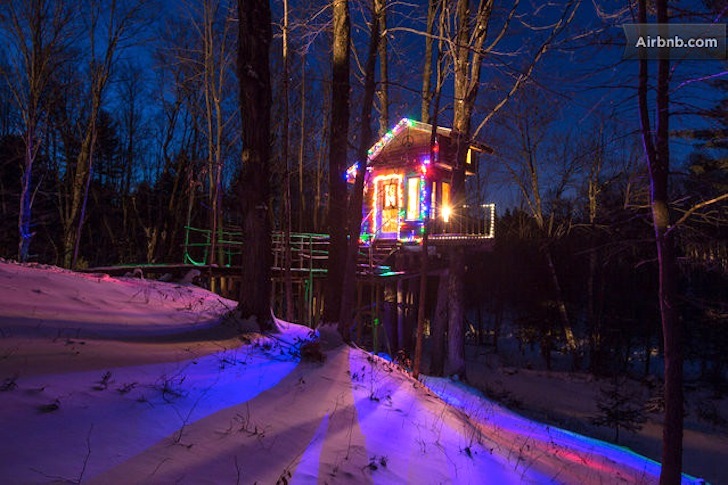 Albeit tucked away in the woods and lit up like a Christmas tree at night, the Tiny Fern Forest Treehouse comes with all of the amenities of the modern world including electricity, heat and even a small refrigerator. Which means it’s possible for guests to completely hideaway adjacent to the Green Mountain National Forest for several days without ever having to leave the comfort and tranquility of treetop living. Just 95 square foot, the tiny space is completely outfitted with linens and it’s even possible to use a new hot tub at the main house. And whilst we know our readers won’t take this option, a more conventional bed is available there too. Also, did we mention that this place is dog friendly? Judging by the pictures and effusive comments from guests who have stayed here, this place is a tiny heaven on a crowded earth. But with a down duvet and small window overlooking the arboreal scene, the work is worth the effort!